Researchers at USC and Harvard have developed a new approach to repair cells deep inside the ear — a potential remedy that could restore hearing for millions of elderly people and others who suffer hearing loss. 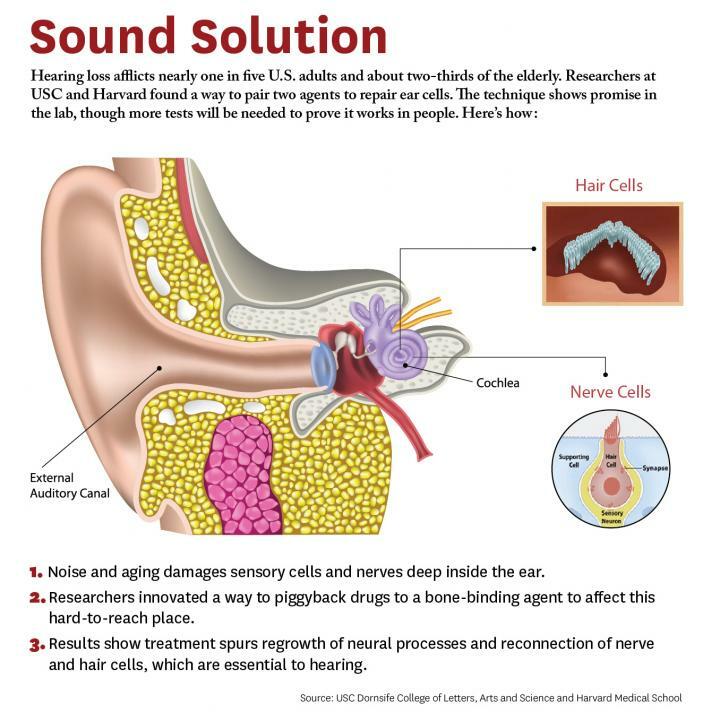 The lab study demonstrates a novel way for a drug to zero in on damaged nerves and cells inside the ear. It's a potential remedy for a problem that afflicts two-thirds of people over 70 years and 17 percent of all adults in the United States. "What's new here is we figured out how to deliver a drug into the inner ear so it actually stays put and does what it's supposed to do, and that's novel," said Charles E. McKenna, a corresponding author for the study and chemistry professor at USC Dornsife College of Letters, Arts and Sciences. "Inside this part of the ear, there's fluid constantly flowing that would sweep dissolved drugs away, but our new approach addresses that problem. This is a first for hearing loss and the ear. It's also important because it may be adaptable for other drugs that need to be applied within the inner ear." The paper was published April 4 in the journal Bioconjugate Chemistry. McKenna co-authored it with David Jung of Harvard Medical School, among others. It is the latest achievement in USC's priority program to advance biomedicine, including the recent launching of the USC Michelson Center for Convergent Bioscience. The Michelson Center unites USC experts across disciplines to solve some of the most intractable research challenges related to health at the molecular level. The facility will house the new USC Center of Excellence in Drug Discovery, with McKenna as its director. There are caveats. The research was conducted on animal tissues in a petri dish. It has not yet been tested in living animals or humans. Yet, the researchers are hopeful given the similarities of cells and mechanisms involved. McKenna says since the technique works in the laboratory, the findings provide "strong preliminary evidence" it could work in living creatures. They are already planning the next phase involving animals and hearing loss. "We're not saying it's a cure for hearing loss," McKenna said. "It's a proof of principle for a new approach that's extremely promising. It's an important step that offers a lot of hope." Hearing loss is projected to increase as the U.S. population ages. Previous research has shown that hearing loss is expected to nearly double in 40 years. Damage to the inner ear can lead to "hidden hearing loss," which is difficulty hearing whispers and soft sounds, especially in noisy places. The new research gives hope to many hoping to avoid loss of hearing and quality of life. The authors include lead researcher Judith S. Kempfle, as well as Christine Hamadani, Nicholas Koen, Albert S. Edge and David H. Jung of Harvard Medical School and The Eaton-Peabody Laboratories in Boston. Kempfle is also affiliated with the University of Tu?bingen Medical Center. Corresponding author Charles E. McKenna, as well as Kim Nguyen and Boris A. Kashemirov, are in the USC Dornsife College of Letters, Arts and Sciences. The USC Michelson Center for Convergent Bioscience, located in Michelson Hall, brings together a diverse network of premier scientists and engineers from the USC Dornsife College of Letters, Arts and Sciences, USC Viterbi School of Engineering and Keck School of Medicine of USC to solve some of the greatest intractable problems of the 21st century – from cancer, to neurological disease, to cardiovascular disease. With a generous $50 million gift from Gary K. Michelson, a retired orthopedic spinal surgeon, and his wife, Alya Michelson, the USC Michelson Center for Convergent Bioscience occupies the largest building on campus, a state-of-the-art facility for USC to transform and influence the course of scientific discovery and biomedicine for generations to come. Information about the USC Michelson Center for Convergent Bioscience is available at https://michelson.usc.edu/.